Happy new year! 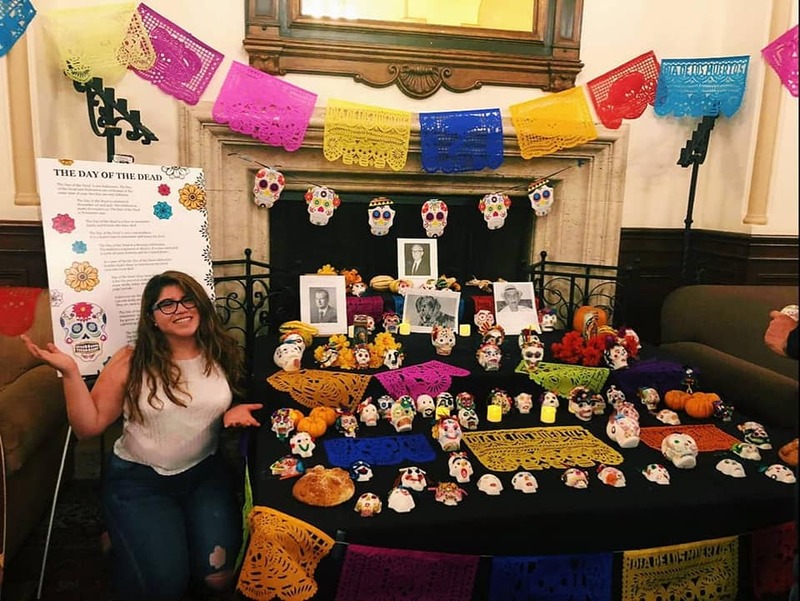 We are pleased to feature a guest post by Monique Rodriguez, a resident who participated in our social media challenge during the Fall 2018 semester. 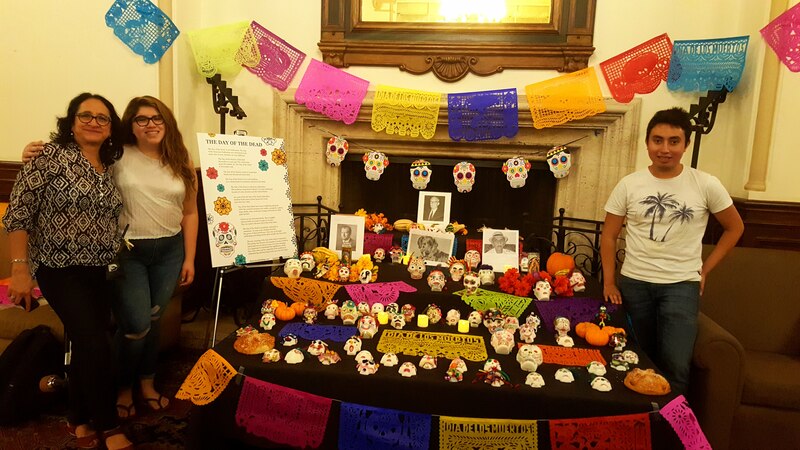 Monique, along with resident Ricardo Martinez, brought the Mexican tradition of Dia de Los Muertos (Day of the Dead) into the atmosphere of International House. 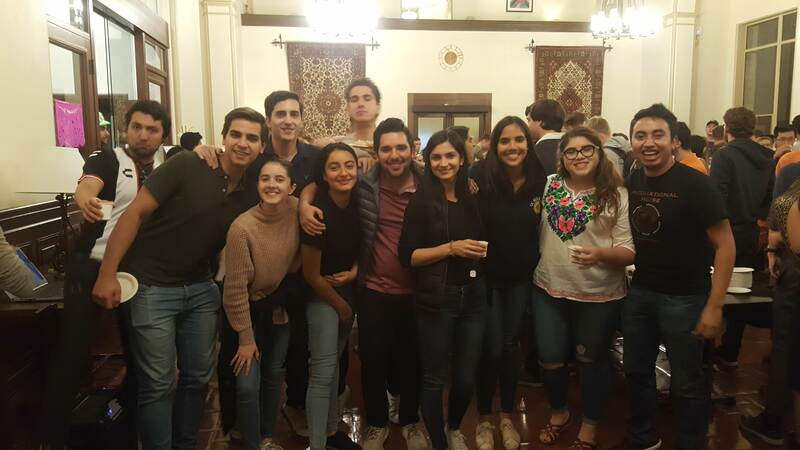 The events were appreciated by both I-House residents and staff. Monique’s guest post below describes the coordination involved in the bringing the unique cultural traditions to life, which included honoring the founder of the International House movement, Harry Edmonds. 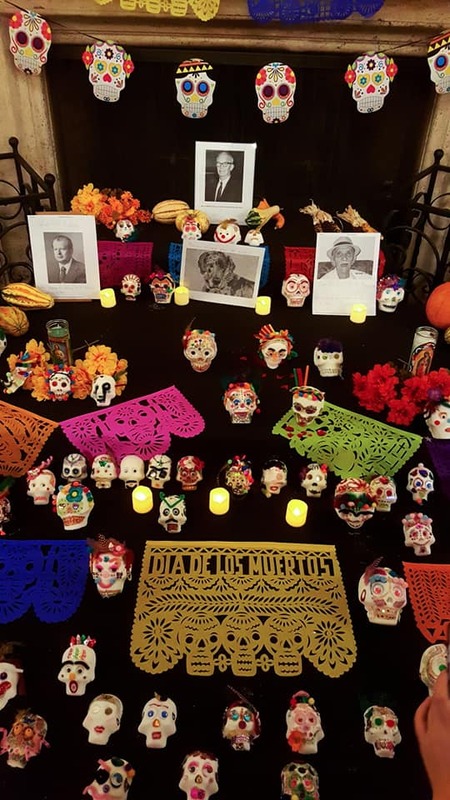 Since the movie Coco has gained so much popularity worldwide, we thought it would be a great idea to implement the real tradition for the global residents to truly see how it all takes place. Fellow I-House resident Ricardo Martinez from Villa de Zaachila, Mexico, and I teamed up on two interactive events to celebrate our heritage: one being the Sugar Skull Decorating Workshop, and the other being a Dia de Los Muertos Coffee Hour–something that has never been done before at International House. We quickly thought of having Resident Support Services manager, Maribel Guillermo, originally from Mexico, as part of the brains behind the making of these events for logistical purposes. 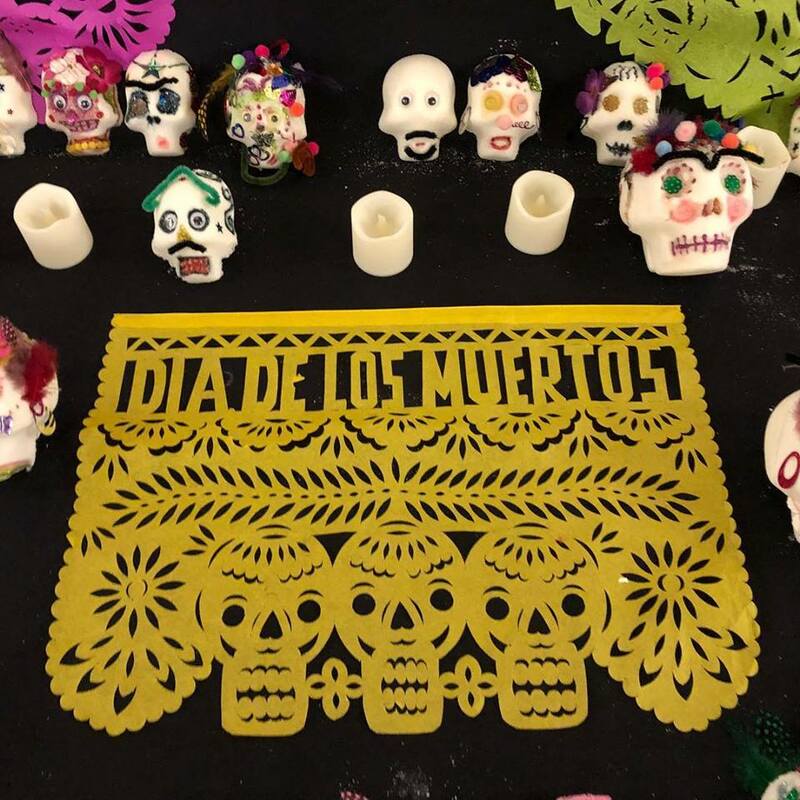 To plan for these events, we brainstormed what was needed to make the Mexican tradition of Dia de Los Muertos come alive: an altar, marigolds, Mexican food, candles, papel picado (thin paper with cut-outs), sugar, skull molds, decorations, etc. First was the molding of the sugar skulls. Ricardo and I spent the Sunday before the week of Halloween crafting the sugar skulls by hand with the Mexican residents that were able to offer their time. At the end of a full day’s work, approximately 75 skulls were made for residents to decorate. The thought of creating a workshop that would allow a tactile way of understanding one’s culture is one that lent itself easily to Ricardo and I, since we have a passion for intercultural exchange and leadership. 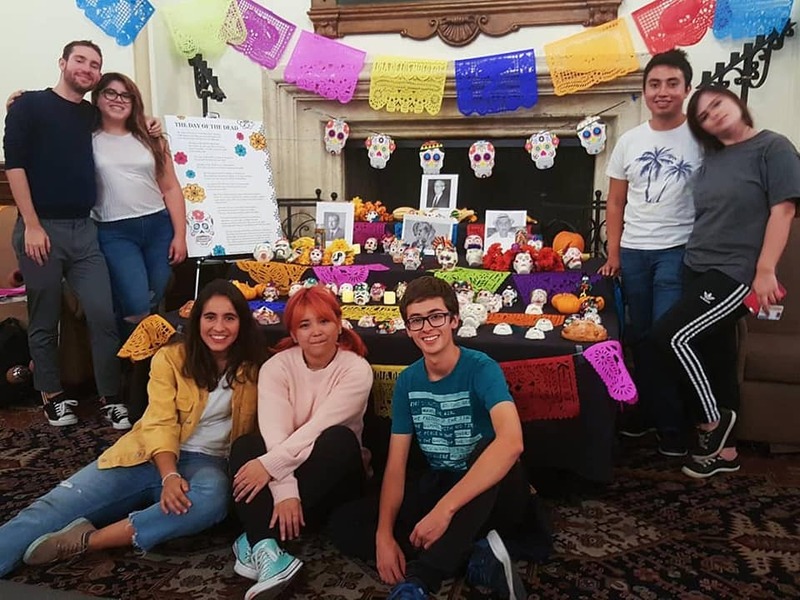 The calaveritas de azúcar (sugar skull) workshop was held on the 30th of October in the Great Hall. 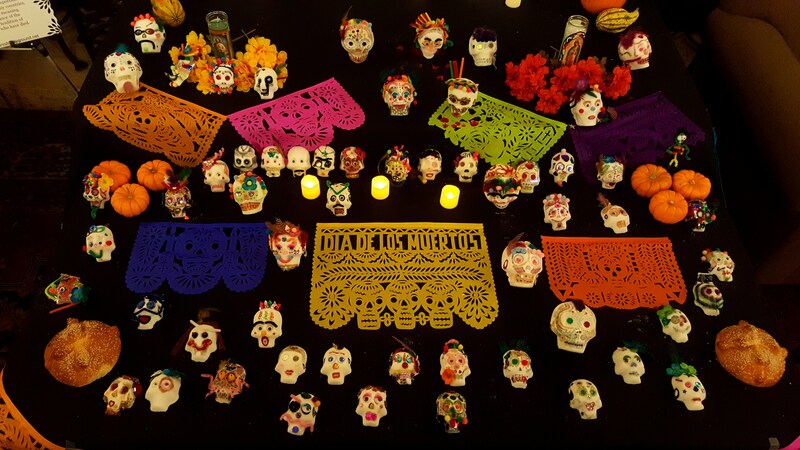 Ricardo and I, along with the Mexican residents of I-House, prepared the crafting tables, altar, and hung up banners of playful looking paper skulls, and the papel picado. 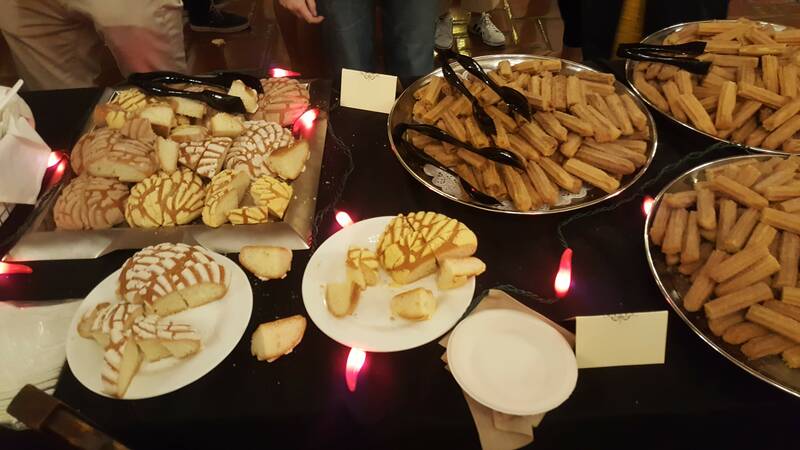 Then, we organized the display of Mexican cuisine, such as squash, corn, chili peppers, and the traditional Pan de Muerto—a delicate soft sugar and cinnamon bread. When the event commenced, Ricardo and I started handing out the handmade skulls that were shaped in different styles and sizes. 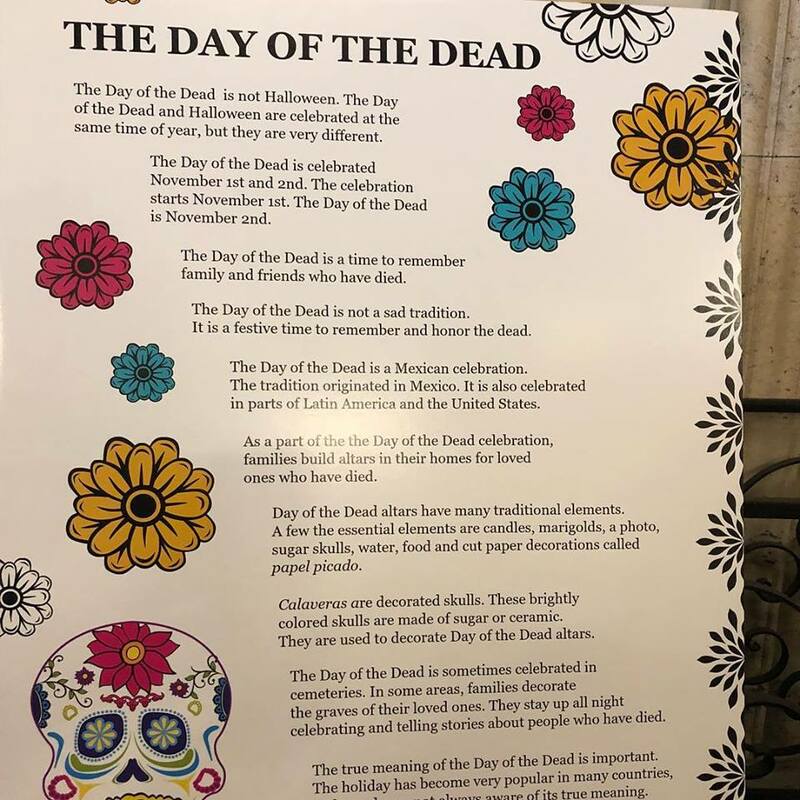 To help those who didn’t know the background of this particular Mexican tradition, a poem dedicated to the Day of the Dead was printed as a poster and displayed on an easel. This promoted an academic background for those who were curious, and perhaps more inclined to read about the tradition first. Before giving the “go ahead” to start decorating, Ricardo played a curated Spotify playlist made up of traditional Mexican music. The residents started feeling the ambiance, and decorated wherever their creativity and imagination took them. 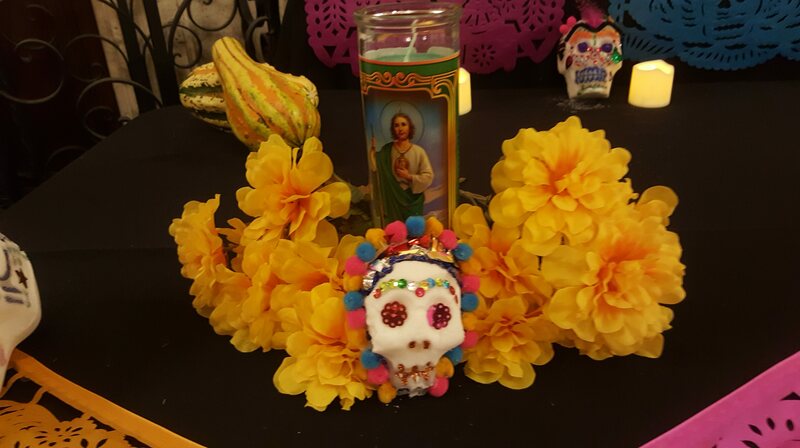 The end result of the fully decorated sugar skulls on the altar evoked many responses from the residents. Ricardo and I welcomed everyone’s questions about the cultural traditions. 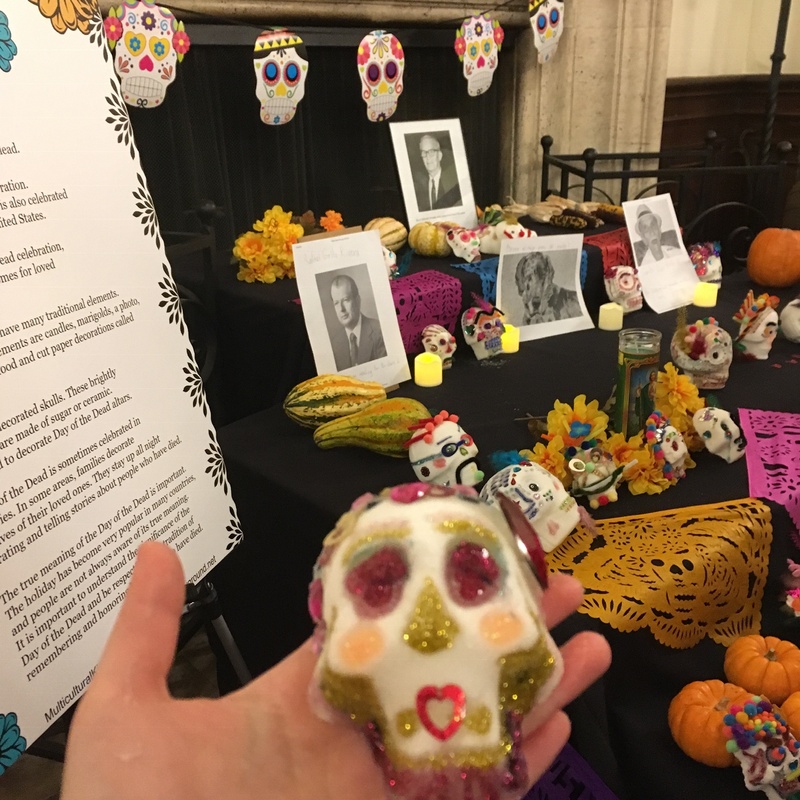 One resident, Juanan (a Program Assistant from Spain) was caught staring at the freshly decorated sugar skulls being placed on the altar in a methodical fashion. I remember Juanan said, “This is so beautiful and sad at the same time, I’m not sure if I understand the altar.” To which I responded, “It’s okay, you’re supposed to feel comfort, sadness, happiness, and remembrance.” Many other residents commented on how they were excited to take part in the activity that they were introduced to visually through the movie Coco. Once the skulls were all done, and the candles were turned on, the entire altar came to life! The idea of placing Harry Edmonds’ portrait on the altar was to commemorate the gift that he had offered to all of the residents whose lives were forever changed by living at the International House. As soon as people started noticing Harry’s portrait displayed on the altar, other residents felt excited and printed out pictures of their loved ones who passed away, be they human or furry pets. It was so beautiful to see how both residents and staff felt comfortable enough to put pictures of grandparents, dogs, cats, cousins, and parents on the altar. Remembering the people that came before us who offered us so much life and wisdom is what makes the tradition so special. It shows that we didn’t get to where we are all in the present day without their sacrifices and struggles, and for that, we should always be eternally grateful. 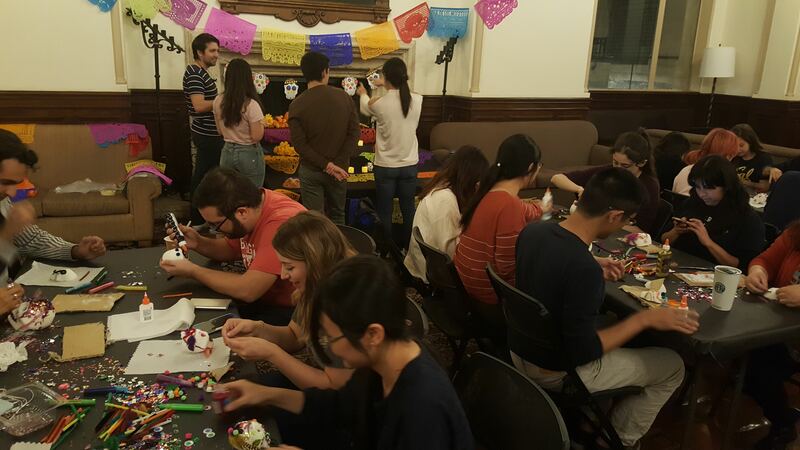 The proceeding event was the Day of the Dead-themed Coffee Hour—the first of its kind held on Halloween! Due to early advertising of both the workshop and the coffee hour, residents were excited to try the food and dance to the vibrant music with friends and family, yes family! Our I-House family. 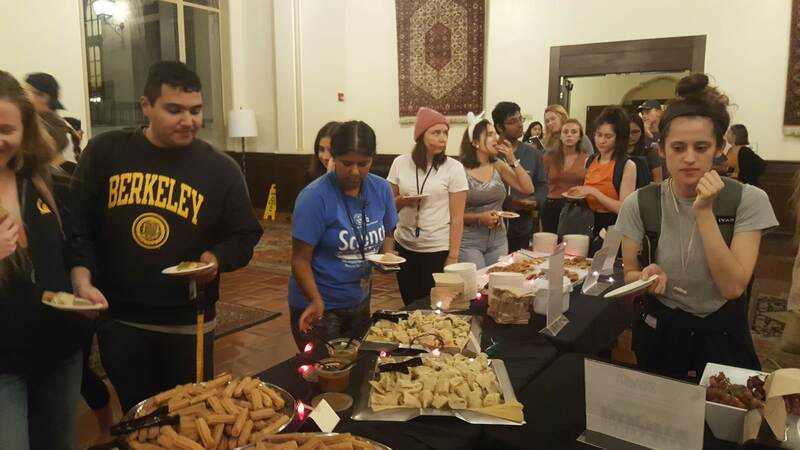 The event was catered by I-House Catering department and a local Mexican market in Berkeley. 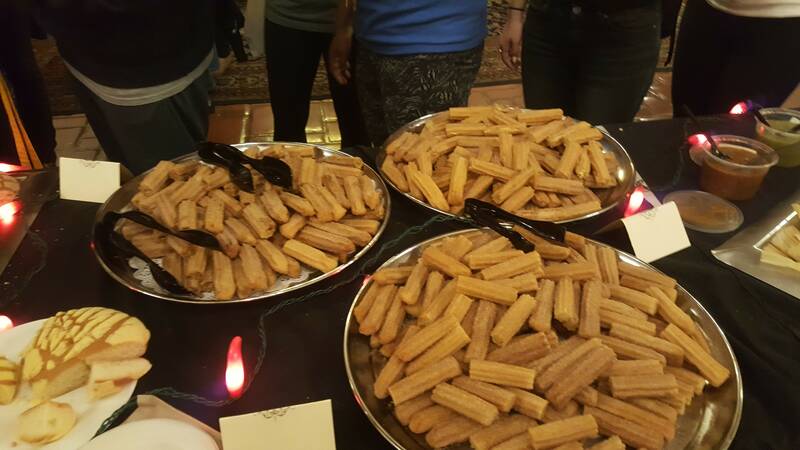 Both chicken and veggie tamales, salsa, lechera (condensed milk) and cajeta (slow cooked Mexican caramel) filled churros, sweet bread called Conchas, and spiced hot chocolate were served family-style. Residents were lined up for 30 minutes straight going down the table of food that served about 400 samples of each food. Everyone adored the diverse flavors in the cuisine, and appreciated the food choices with dietary restrictions displayed clearly. 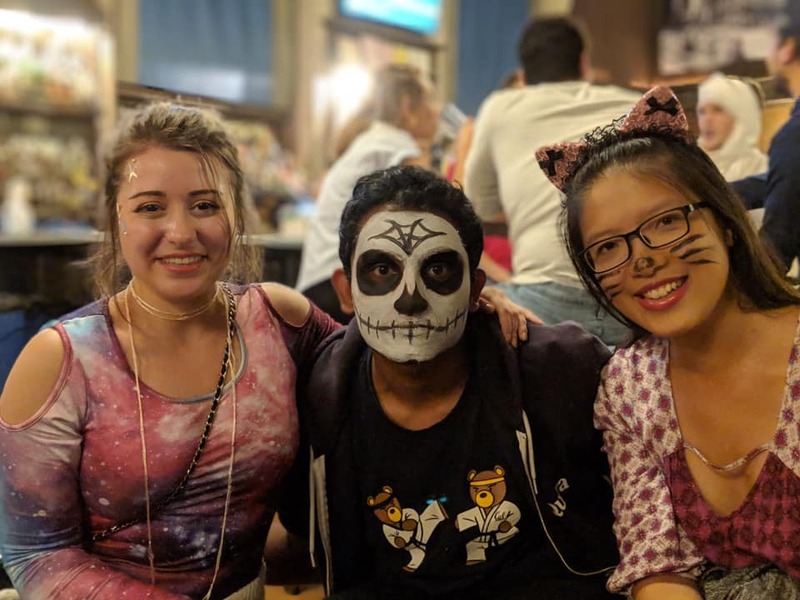 I-House HR staff Veronica and Front Desk receptionist Gemma also volunteered to take part in the Coffee Hour by establishing a skull face-painting station—allowing residents who didn’t have a costume to have their face painted into skulls to celebrate the entirety of the remaining night out with friends for Halloween. 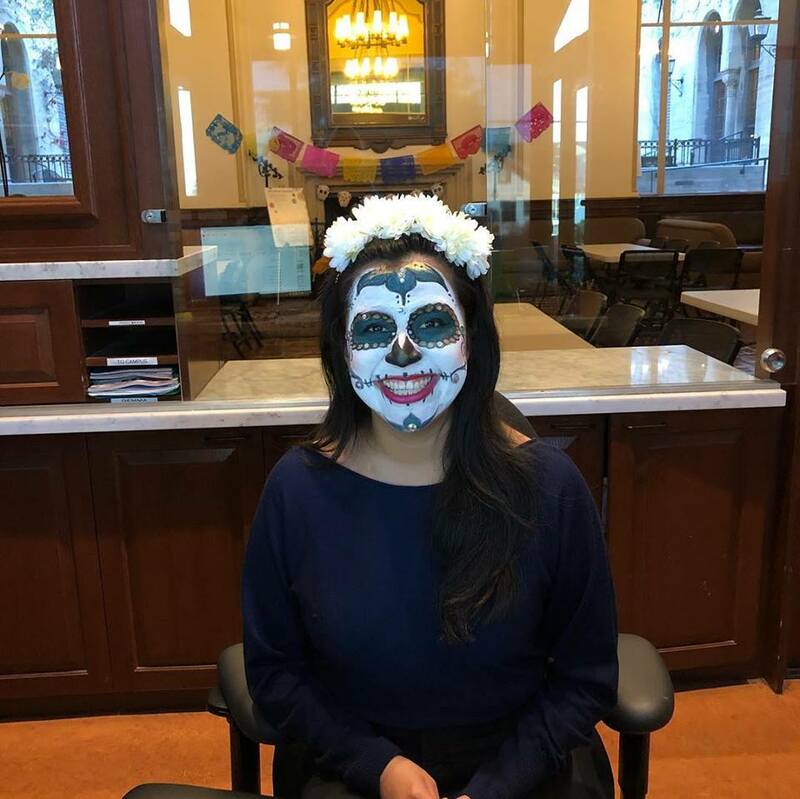 Gemma Givens, Front Desk Operations Coordinator by day, skull face painter at Dia de los Muertos Coffee Hour! All in all, the effort put into sharing a culture that may have been new to some was a mission Ricardo and I were willing to take on—no matter the time sacrificed or hard work; and quite frankly, the event was a hit! Residents were commenting weeks after the event that they were, “the best events put on in the house” or “it was a memory that they will cherish and share with family” in their own distinct way. 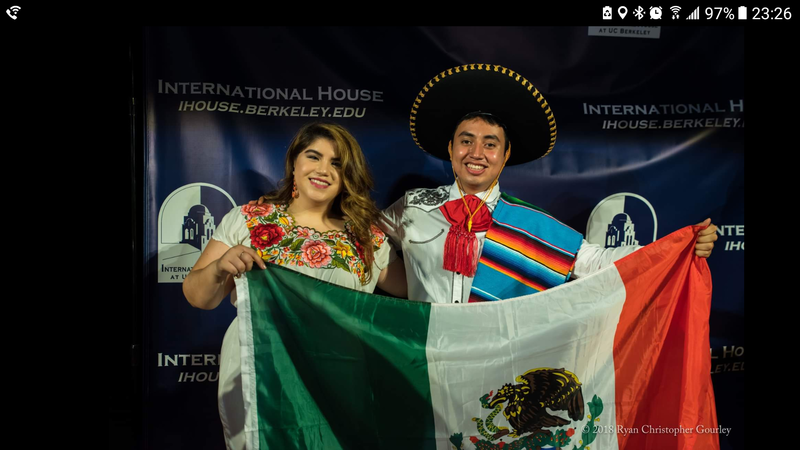 It was an honor to share a bit of my culture with the house, and only hope to continue such events to develop intercultural awareness and leadership. Monique Rodriguez is a transfer student from Fullerton Community College, now a Senior at UC Berkeley. She originally comes from Cudahy, California – a humble community that is hard to move out of, due to the low resources and high gang violence. Ever since she was a young girl, Monique had a vision to help others and she worked hard to do just that. 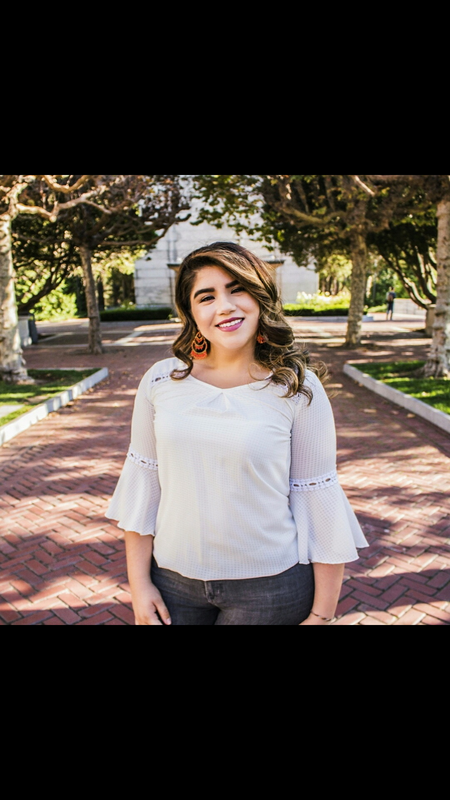 While attending community college, Monique worked at a drop-out prevention program called the Independent Learning Center (ILC) her high school started after she had graduated and started college. At the ILC, Monique helped and mentored at-risk high school students complete their academic credits to obtain a high school diploma even though the students thought that, “school was not for them.” Wanting to implement a social-emotional platform in the ILC, Monique launched art therapy sessions, healing girl talks, reading clubs, volunteer opportunities, and campus tours in order to shed some light on what else the students could invest their time in get them off of the streets. Given that Monique came from similar life backgrounds as her students, she was a mirror for them to achieve their aspirations. During the three years she spent working at the ILC, she had helped approximately 300 students beat the odds and graduate from high school each year she worked at the ILC. 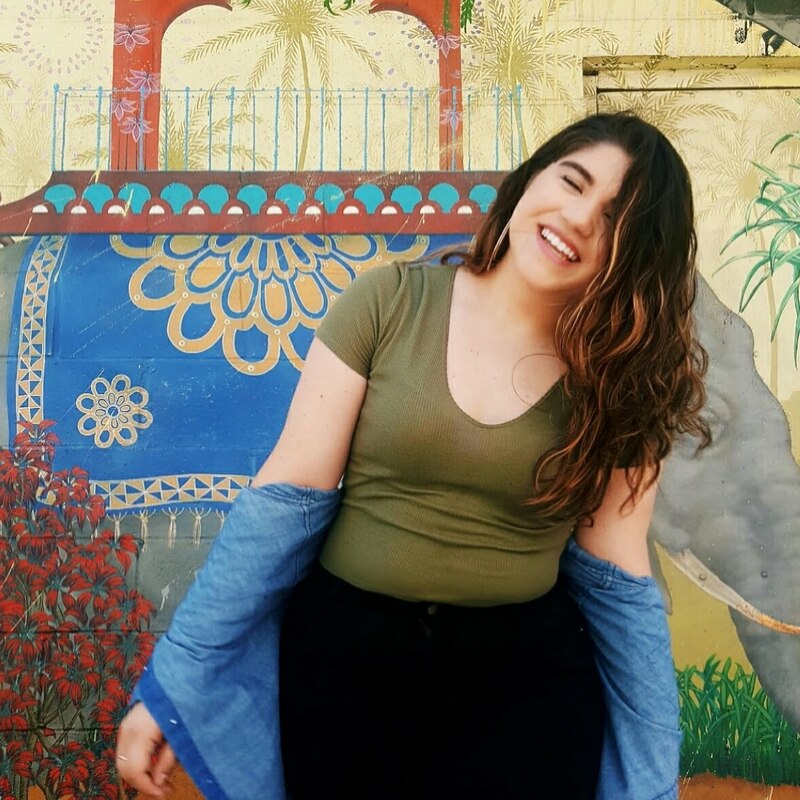 Because of her passion to help others and make a difference, Monique a current Resident Assistant at International House, studies Sociology and Social Welfare; and has chosen to implement her love for service and global learning to all individuals she meets. 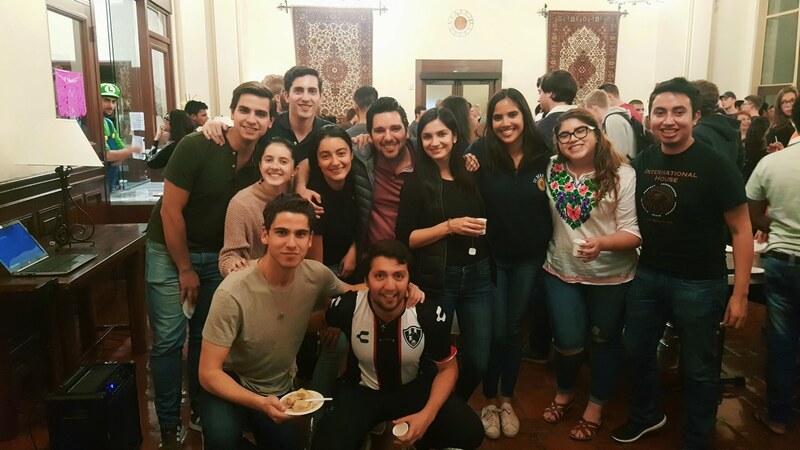 Intercultural leadership and exchange are Monique’s core values. She hopes to share those same values learned at her time at International House with low socioeconomic marginalized communities to ensure that she makes an impact in the community she comes from. She hopes to accomplish this by becoming an Academic Counselor to not only support, but to help future low-income generations move forward in life. This entry was posted in Life at I-House and tagged Friendship, fun, holidays, I-House Life. Bookmark the permalink.